DO YOU DREAM BIG? What’s the difference between a dreamer and someone who achieves a dream? According to best-selling author Dr. John Maxwell, the answer lies in answering ten powerful, yet straightforward, questions. Now you can put your dream to the test and bring it to life! Join Leadership Coach Dr. Jacquie Hood Martin, CEO of J. Hood & Associates, for this transformative series of classes that will help you reveal a future where your dreams can be fulfilled. Whether you’ve lost sight of an old dream or you are searching for a new one within you, Put Your Dream to the Test provides a step-by-step action plan that you can start using today! 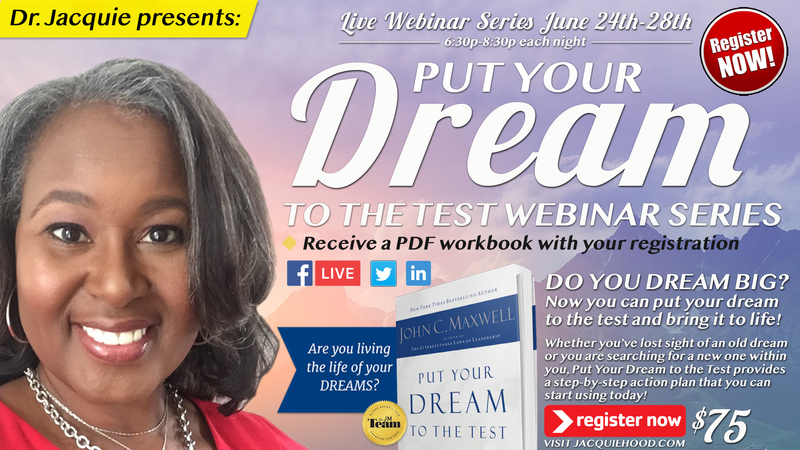 Join Dr. Jacquie Hood Martin for the Put Your Dream To The Test live webinar series June 24th-28th @ 6:30p-8:30p each night. The cost for this transformative course is $75. Register securely online via PayPal using the buy now button below. For more information about this transformative series contact Dr. Jacquie using the contact form below.